Did Trump’s Campaign Manager Assault a Female Reporter? The videos are flooding in, the verdict is out, but either way, Trump has sowed enough doubt to come out on top. We’re now deep in a media fog of denials, double-downs, and Donald-created doubt about whether Trump’s campaign manager physically assaulted a female reporter from the conservative Breitbart News. The farrago began late Tuesday night as Trump mingled with the press after his infomercial/press conference celebrating his primary wins in Michigan and Mississippi. As Michelle Fields tried to ask Trump a question, someone violently yanked her left arm, nearly throwing her to the ground and leaving her bruised. Washington Post reporter Ben Terris, assigned to do a profile centered on Lewandowski, witnessed the assault and identified Lewandowski as the culprit. Team Trump denied this ever happened, and in a series of tweets, Lewandowski tried to smear Fields as an “attention seeker.” But audio released by Politico seemed to confirm Terris’s account, which he wrote about here. And left and right, nearly everyone has attacked the fervently pro-Trump Breitbart for only weakly defending its own reporter. But after Terris’s report, Breitbart got some backbone and stood up for Fields, issued statement saying it was “disappointed” in the Trump campaign, and asked for (not exactly demanded) an apology. Breitbart also suspended reporter Patrick Howley for attacking Fields’s veracity, and even ran Grove’s scathing piece, DAILY BEAST: BREITBART ROLLS OVER AFTER REPORTER ‘GRABBED’ BY TRUMP AIDE, on its front page. Contrary to what Donald Trump said Thursday evening after the GOP debate, the incident certainly happened. However, the person who made contact with Fields was likely not Trump campaign manager Corey Lewandowski…. Fields was indeed hurt in the altercation, and published a photograph of her bruises. Yet the available evidence from WPTV and ABC suggests that it was unlikely that Lewandowski was the person who caused her injuries. 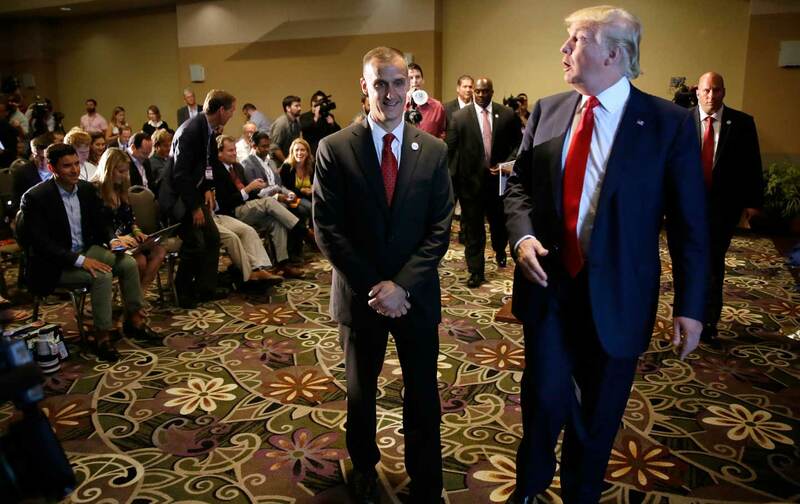 Given the similarity in appearance between Lewandowski and the security official, and given the fact that Lewandowski was walking on the other side of Trump from where Fields was at the time, the possibility of mistaken identity cannot be ruled out. Indeed, given Lewandowski’s adamant denials (coupled with statements inappropriately impugning Fields’s character), it is the likeliest explanation. So, at the moment, no one can prove exactly what happened. Fields has filed a police report and Florida law enforcement is investigating. Of course, what makes the accusations against Lewandowski so believable is that they come in the midst of increasing violence at Trump rallies. The day after Fields incident, Rakeem Jones, a black protester who was being escorted out of one of Trump’s rallies, was sucker-punched by John McGraw, a 78-year-old white man, who later said, “next time we see [Jones], we might have to kill him.” Security officials wrestled Jones, the victim, down to the ground, leaving McGraw free, though he was later arrested and charged with assault. And recently a Secret Service agent at a Trump rally placed Time photographer Chris Morris in a choke-hold when he tried to step outside of the press pen. The Department of Homeland Security is investigating. After Thurday’s debate (during which CNN asked about the Jones’s incident but not Fields’s), Tur asked Trump about Lewandowski. Without video, we have to assume it didn’t happen and that she made it up, Trump said. Will you apologize or punish Lewandowski if it’s proven that he did attack Fields, she asked. Will you apologize if it didn’t happen, he fired back, and stalked off. Whatever the various videos prove, whether Lewandowski attacked Fields or not, the doubt that Trump so masterfully sowed leaves him coming out on top, again. That makes it even more likely that, should he become president, he’ll try to “open up” libel laws–making it easier to sue and intimidate the press and harder for them to report the truth.